Tempos Interessantes: You Are Ridiculous Mr. Juncker! You Are Ridiculous Mr. Juncker! Mr. Jean-Claude Juncker declared at a conference that the English language is losing importance in Europe: “Slowly, but surely English is losing importance in Europe.” (in “Jornal Económico” at http://www.jornaleconomico.sapo.pt/noticias/o-ingles-esta-a-perder-importancia-na-europa-diz-juncker-em-frances-154821) It is clear the spite in which the EU’s chief bureaucrat holds the United Kingdom. However, he chose an absurd sting to get at the UK and thus he covered himself in ridicule. Jean-Claude Juncker, a ridiculous man. The English language is on a roll for decades and its influence, use and influence increases by the day and that is not going to change with Brexit. Mr. Juncker seems to think that his beloved and decaying union is the centre of the world, but it is not. He also seems to believe that the use of English is tied to Brussels’ whims, but it is not. English is the common language almost anywhere you go. I got to teach to classes with students from 6 different nationalities and languages and ENGLISH was the ONLY common means of communication. Whatever else I would speak would be a dead end to a part of the class. Not even Latin would make the trick. And we can move from empirical evidence to statistical facts: of students in lower secondary school, outside Great Britain, learning a foreign language, 97% are studying English, 34% French and 23% German. Furthermore, 79% of primary school students are learning English; a meagre 4% study French. (data from “The Economist” at http://www.economist.com/news/europe/21721861-despite-jean-claude-junckers-joke-anglophones-should-rest-easy-britain-leaving-eu-its?cid1=cust/ddnew/n/n/n/2017059n/owned/n/n/nwl/n/n/eu/Daily_Dispatch/email&etear=dailydispatch How about that Mr. Juncker? How much more clownish can you get? 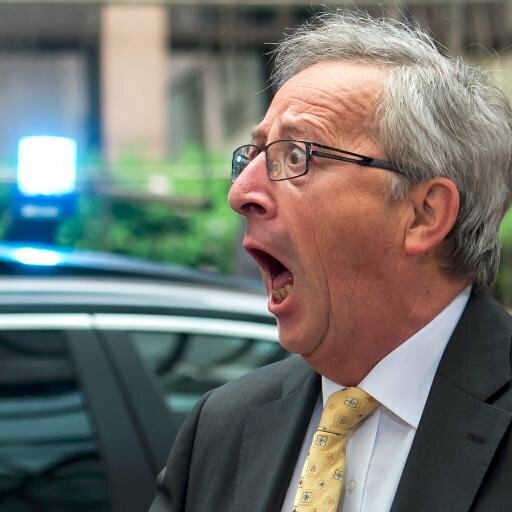 Mr. Juncker frequently speaks nonsense and engages in strange and dubious behaviour. Being spiteful and resentful apparently have made him worse, but that will do nothing to advance whatever negotiations stands he may want to engage in. Being ridiculous tends to make you look neither credible, nor reliable. You will eventually be scorned and set aside. And you are really ridiculous Mr. Juncker. Juncker foi o mais criativo e nebuloso, dizendo que os jornalistas lhe colocaram questões num sítio escuro, onde não se ouvia (??) bem e que por isso não teria respondido bem. Enfim, uma declaração pueril, bizarra e até hilariante, se imaginarmos Juncker encurralado num canto escuro por ávidos jornalistas. Registe-se que vi o Senhor Juncker proferir as primeiras declarações, o local não parecia nada escuro, o senhor falava bem à vontade e com vontade. So, one can only imagine the shock the first group must have felt when Jean-Claude Juncker, the archetype of Euro-federalist-Brussels insider-EU fundamentalist, declared that France will NOT be punished for exceeding the 3% budget deficit ceiling, because…. It is France: The European Commission has given France leeway on fiscal rules "because it is France," the president of the EU executive Jean-Claude Juncker said (…).